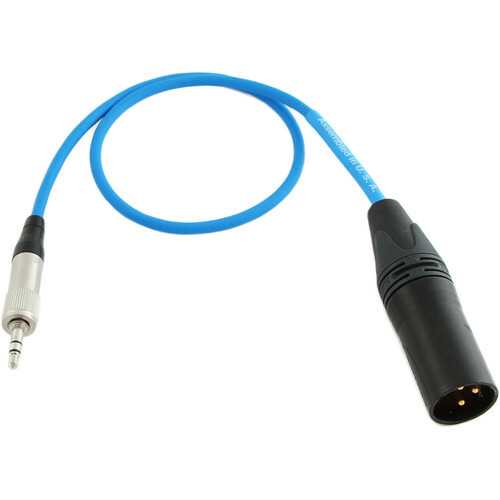 The 12" blue 3.5mm TRS to 3-Pin XLRM Unbalanced Cable from Cable Techniques is an unbalanced audio cable with a 3.5mm TRS locking connector on one end, and a 3-pin XLR male jack on the other. It is designed for use with Sennheiser EK 100 G3/G4 wireless receivers and devices with XLR inputs. It is also compatible with most devices that have matching connectors. The cable is made from durable components, ideal for the demands of field recording. Box Dimensions (LxWxH) 5.7 x 5.3 x 0.6"
3.5mm TRS to 3-Pin XLRM Unbalanced Cable (12", Blue) is rated 4.8 out of 5 by 4. Rated 5 out of 5 by Anonymous from Good replacement for the original cable The cable is thicker than the OEM model, which inspires confidence in its long-term durability. It's well worth getting an extra or two to have on hand in case your existing cable goes south in the middle of a shoot so you're not dead in the water. Rated 5 out of 5 by Anonymous from Nice quality Not something to skimp on, your gear is only as good as the weakest link. These are nice quality cables and they fit the treads on my sennheiser mic packs perfectly. Rated 5 out of 5 by DaveTV from Better than the original! Great build, seriously better than the one that came in the box with my wireless. Rated 4 out of 5 by Anonymous from Great Buy! Great Buy. Good Product! Will this cable work with the Rode News Shooter Kit Receiver? Will this be compatible with the Azden Pro-XD Wireless Lavalier system replacing the included 3.5mm to 3.5mm cable? I'll use this to connect the Azden into an XLR-based Recorder (DR-70D). Will this cable work with Sennheiser EW 100 G2 Receiver?